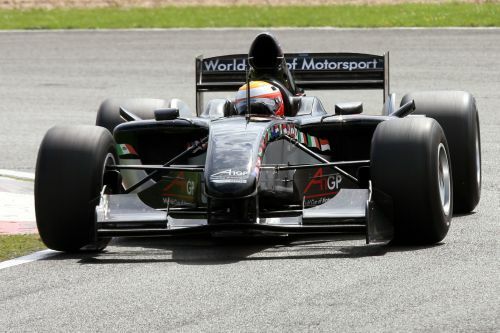 The new A1GP Powered by Ferrari cars were in testing action again over three days last week - on UK soil for the first time at Silverstone International Circuit in Northamptonshire. The new black A1GP liveried machine made its debut running alongside the yellow test car as the first real comparisons could be seen on a circuit where the previous A1GP cars had clocked up extensive testing miles. On Monday and Tuesday Danny Watts was at the wheel of the car, so becoming the first driver to have tested both the old and new A1GP cars. "It has noticeably more power," he commented. "The new aero package helps driving through the high speed sections of the track even quicker. The carbon brakes work extremely well meaning you can brake a lot later than you ever could before. It’s much more like a thoroughbred racing car. Overall the performance is a step up in every department. I thoroughly enjoyed driving the car." FIA GT Champion, Thomas Biagi, drove all three days while Jonny Kane was also in the car on Wednesday. The programme for Silverstone also included testing the new PowerBoost system. 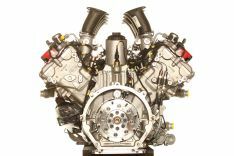 The new 8-cylinder Ferrari engine has a power output around 600bhp when drivers hit the PowerBoost button, giving approximately an extra 60 horsepower overall compared to last season. An impressed Watts said: "The extra 60bhp you get with the push-to-pass will open up more overtaking opportunities at every circuit A1GP visits this season which should make racing even more exciting." 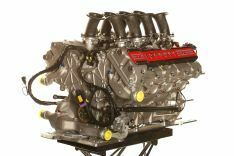 The test also allowed the opportunity for A1GP’s photographer to get the first shots of the new Ferrari engine out of the car. The design team has also released the car’s dimensions as below, showing the new car to be slightly shorter in length but wider overall with a slightly higher ride height. A1GP General Manager, Technical and Operations, John Wickham: "The test was very encouraging and both test drivers gave very useful feedback. The brakes have much, much better performance, the engine is stronger, and it is more powerful and has more torque. We have obviously moved forward with this car. With this we have now covered 6100-kilometres testing with the first test car and 581-kilometres with the second." A1 Team Switzerland has won the 2007/08 A1GP World Cup of Motorsport title.